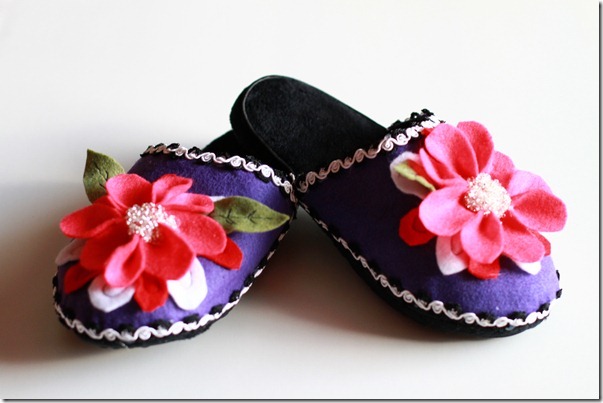 As promised in my post, Whimsical Slippers, here is the tutorial to make these cute, one of a kind, slippers in ten easy steps. 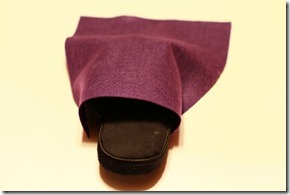 I apologize that most of these pictures are dark and golden. 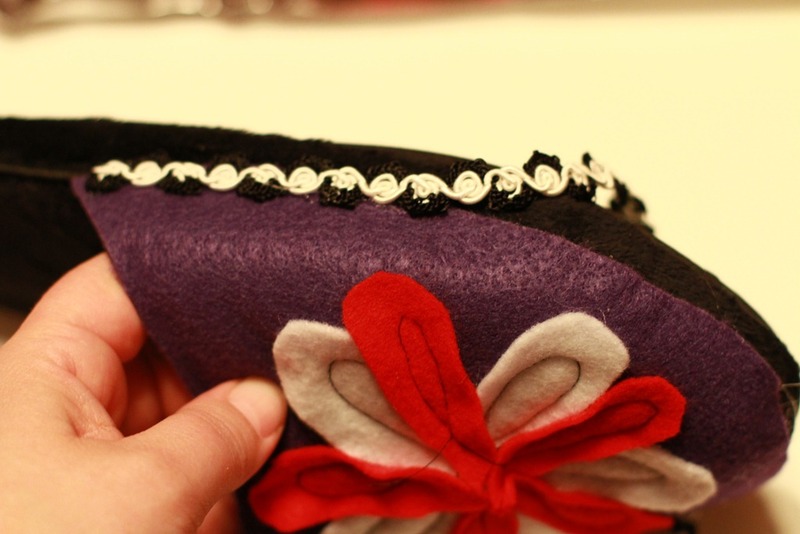 It was crafting at night and had limited lighting. Step 2: Cut purple felt to fit top of slipper. 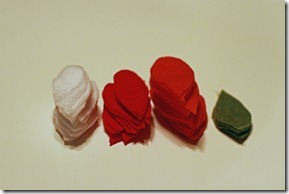 Step 3: Cut 10 white petals, 10 red petals, 18 hot pink petals and 4 green leaves. 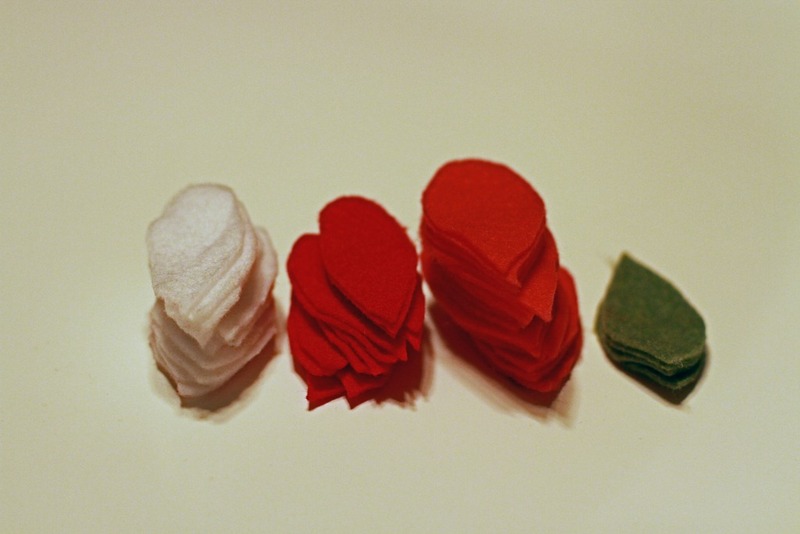 I cut multiples at a time. 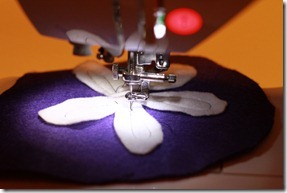 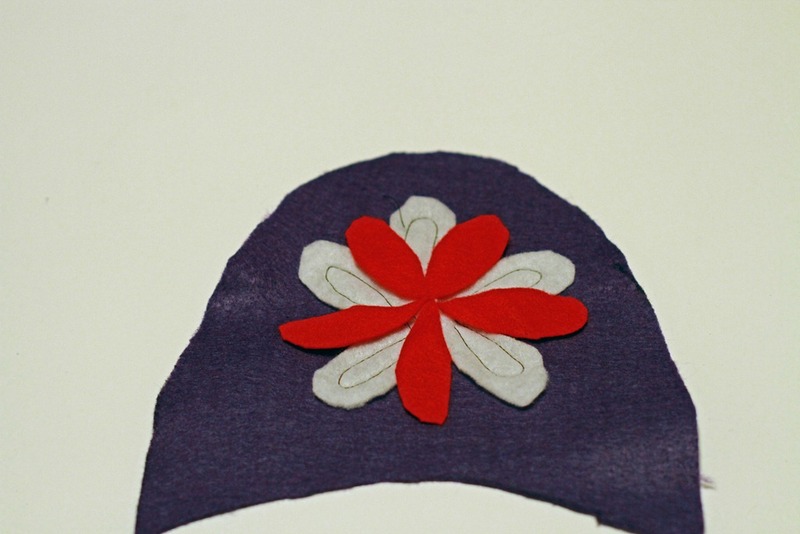 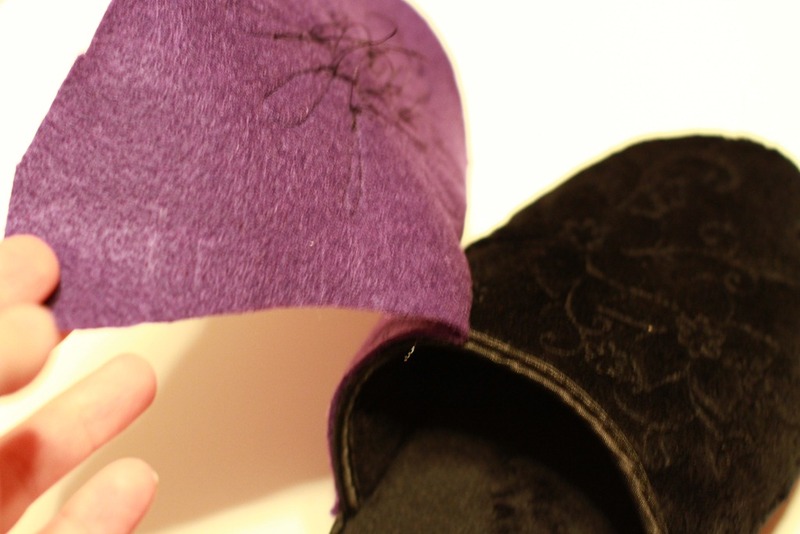 Step 4: Using your embroidery presser foot, stitch petals onto purple felt. 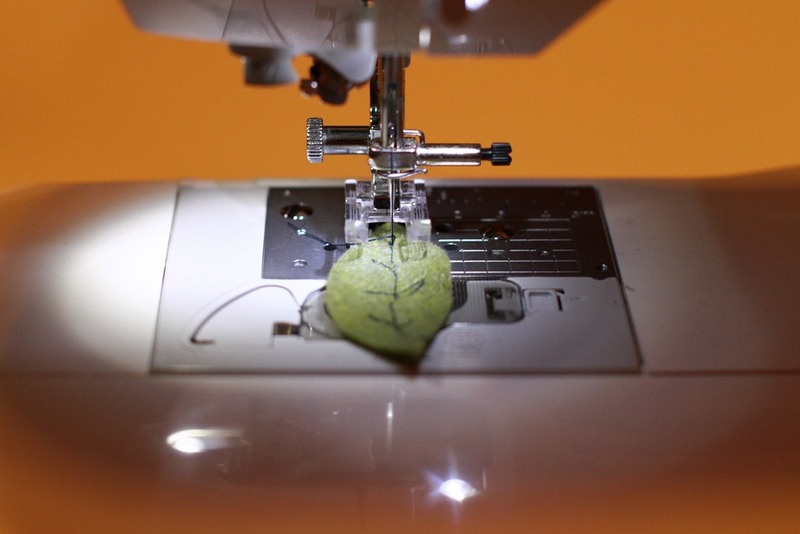 Step 5: Stitch veins onto leaves. 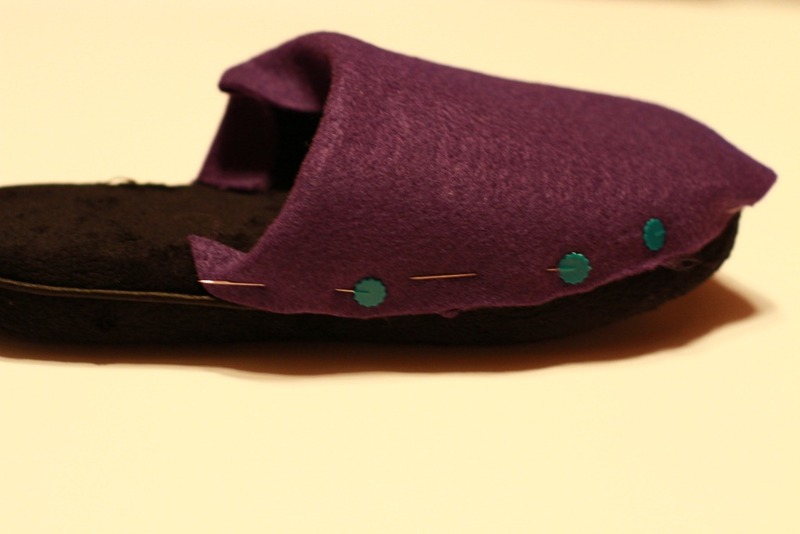 Step 6: Hot glue purple felt onto slipper. 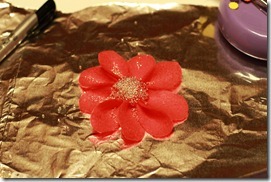 Step 7: Hot glue hot pink flower petals together to make dimensional flower. 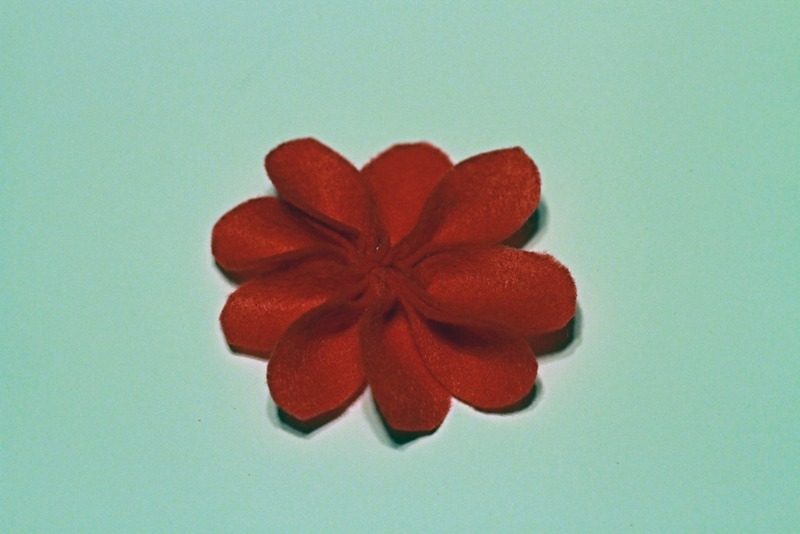 First put a dab of hot glue and the bottom of each petal and pinch together to make dimension, then glue all nine petals together to form flower. 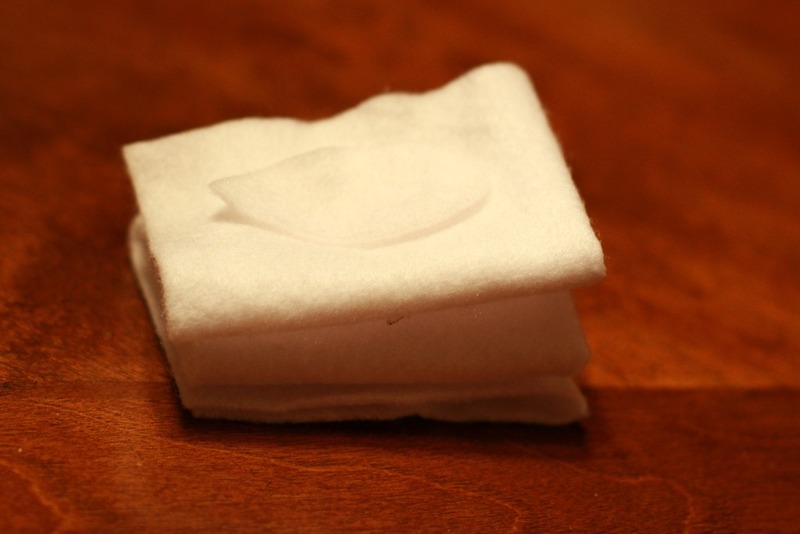 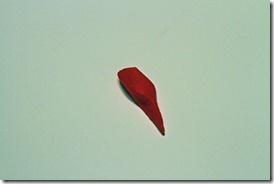 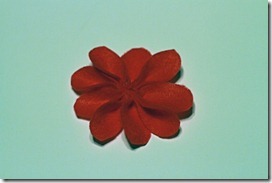 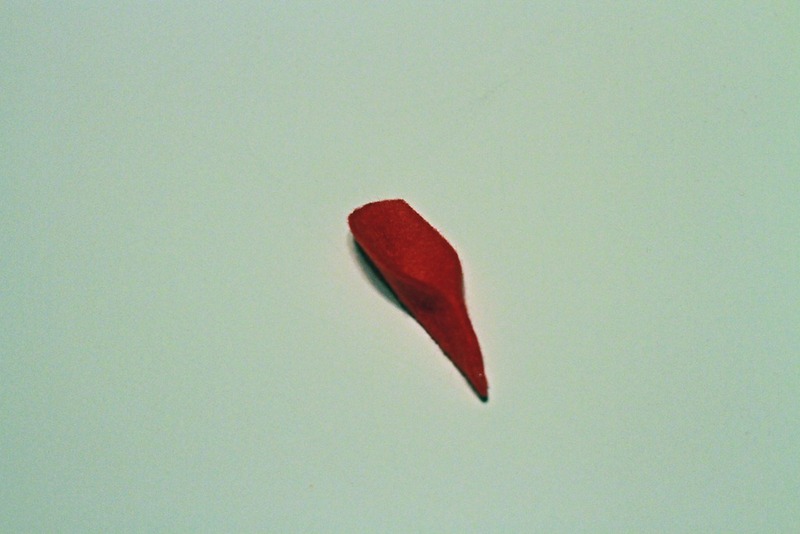 (Note, the pointed end of the petal is cut off so the petals can fit together nicely. 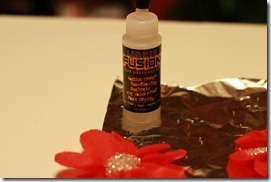 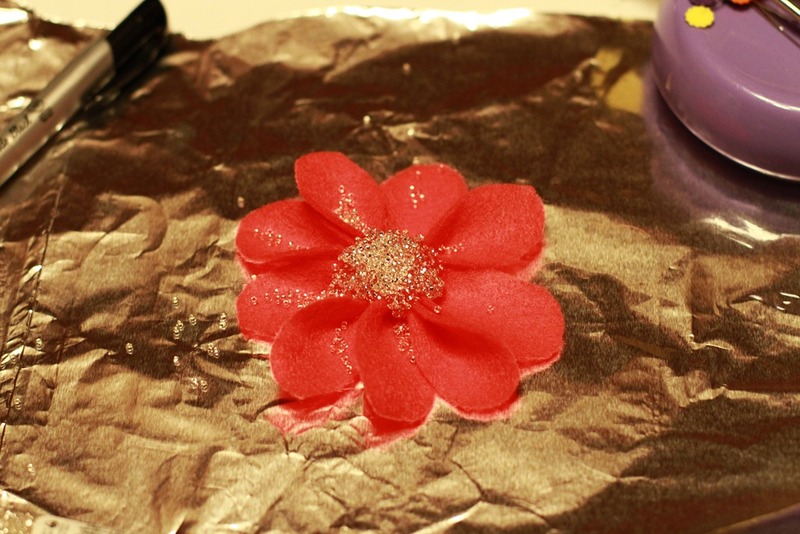 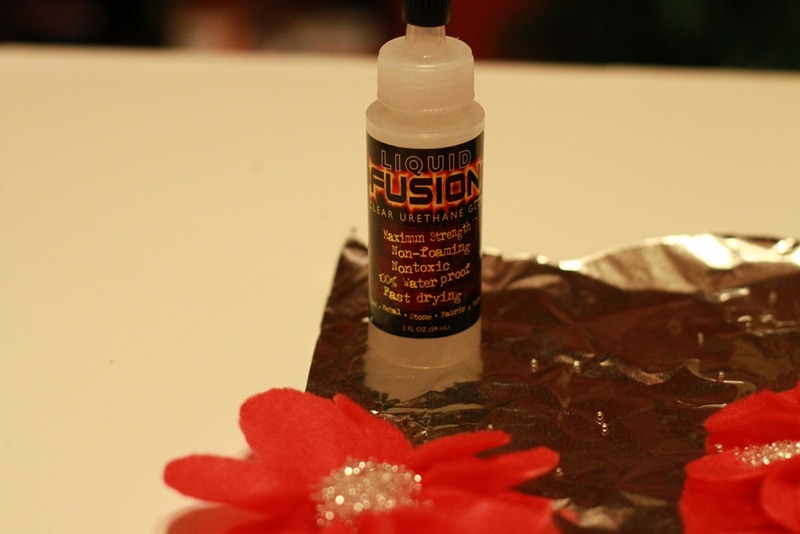 Step 8: Using Liquid Fusion, pipe glue onto middle of hot pink flower and sprinkle small clear beads in to center. Let dry for 2 hours. 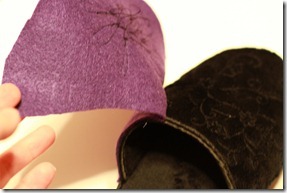 Step 9: Hot glue trim onto slipper. 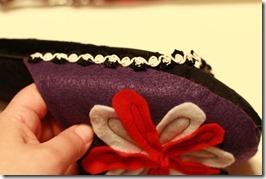 Step 10: Hot glue pink dimensional flower and green leaves onto slipper top. And there you have it, a whimsical pair of slippers! 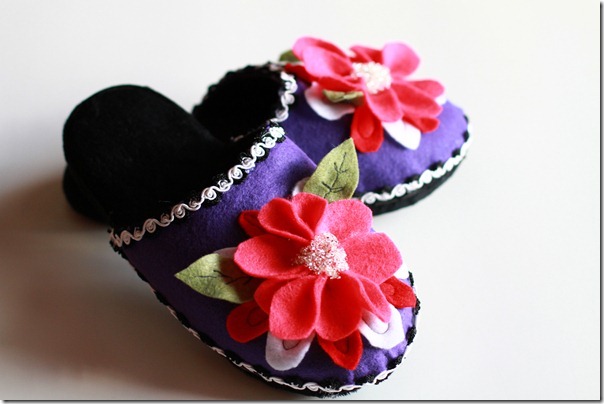 To see my pattern for the slipper top and flower petals and leaves, click here. 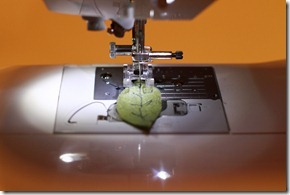 This entry was posted in Art, Daily Drivel, Faith, Home Sweet Home, How to, Tutorials. Bookmark the permalink.